I’ll be honest – I’m not the most organised person in the world. Frankly, I’m not organised at all. But occasionally when I have a big blog project coming up, I have to put the habitual laziness aside and garner the energy to plan and prep ahead in order to ensure that the final outcome is somewhat of a satisfactory standard. Granted, a lot of procrastination and dilly-dallying is typically involved – not gonna’ lie. 1.Take a step back and put your ideas on paper by creating a mind map. This allows you to brainstorm in a logical fashion by putting all of your ideas into perspective. Everything and anything that pops into my head that is relevant to the project, I always note down; even if it seems irrelevant at the time, it may serve a purpose at a later date. Tip: Inject some colour into your annotations and doodles to make the whole process a little less boring – I love my bright markers, highlighters, post-its and smelly pens! Being organised is all about having strawberry scented scribbles. 2. 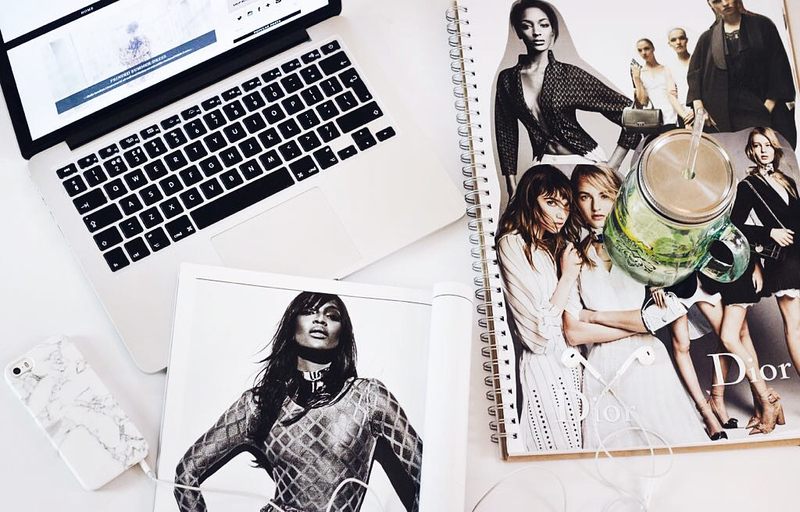 In order to get my creative juices flowing, I typically like to scan through my collection of magazines and cut out any outfits or fashion features that are currently trending. I then use these cut-outs to create a mood board, and I will use this collage to inspire me with an upcoming post. Tip: If you don’t have the time or patience to create one yourself, Pinterest is a great alternative. You can save pictures under multiple themed boards and come back to them as often as you like for inspiration. 3. I like to anticipate every scenario that may potentially affect my work. For example, as a blogger, I always have to take the weather into consideration for photography shoot purposes, therefore I have to religiously check the weather forecast. Other important variables to consider are memory card space, camera battery and shoot settings and locations. 4. Research, study and practice! I cannot tell you the number of times where I felt frustrated and wanted to retire as a blogger because I felt my work was not comparable or nowhere near as good as that of other bloggers. However, I have learned to go out there and ask for advice from other experts in the field. I am incredibly lucky to be surrounded by many talented people who are happy to help and the patience to teach. From photography to photo editing, to video taking and move processing, I have reached out to many people and the tiniest bit of advice has always been invaluable. Although I still have a long way to go, I can already notice a significant difference from when I first started, and I know that over time I will just continue to get better and better (or so I hope so!). That’s all, for now, folks! If you have any questions or would like me to elaborate on any of the points above please comment below with your questions! PS: How gorgeous are my new laptop and phone marble case from Caseapp? Use my code ANASOFIACHIC20 for 20% off all laptop and phone cases!